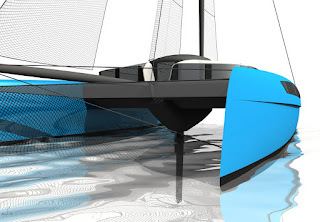 A modern catamaran designed with modern tools. A safe, lightweight, modern sportster fast enough to be raced competitively and capable of accommodating a crew of 7. 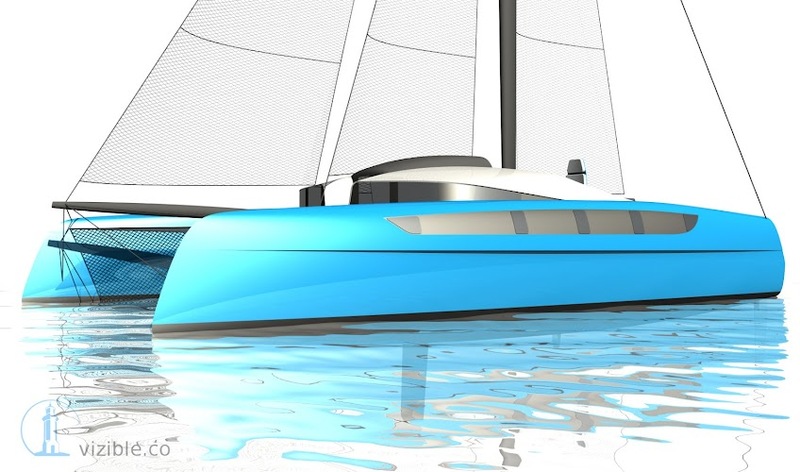 Performance and comfort aside, one of the most striking features of this design is affordability, since it is useless to dream about your perfect boat if it remains a dream. VIZIBLE105 was designed for homebuilding but it is equally suited for production as well, addressing large or small start-up builders. This is the ultimate modular small cruiser. Scroll down for more details. 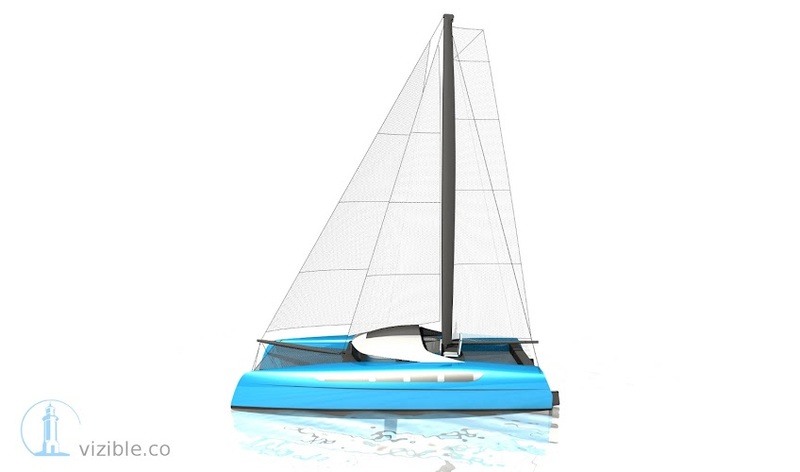 A cutter variation rig provides an effective sail plan for short handed sailing and comfortable cruising. The foresail can be tacked from port to starboard by a swinging bowsprit leaving the stay sail in clean air. The sail area is distributed in three smaller sails, reducing the loads in the hardware and sheets. A smaller mainsail is much easier to trim, hoist and reef and carries a lower price tag. All trimming is routed to the central helm stations for comfortable and safe operation of the running rigging. 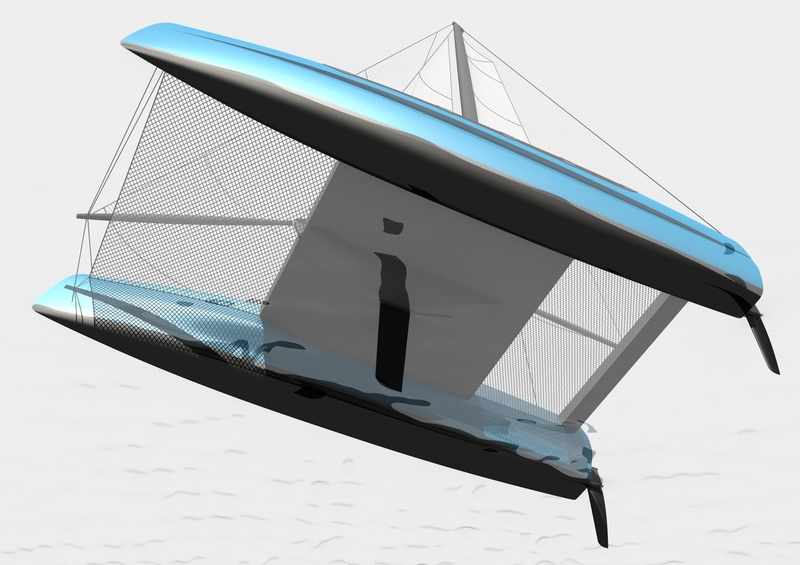 The flexible sail plan allows outstanding balancing of the helm both up and downwind. 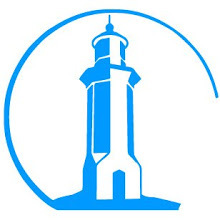 The entire sail area is carried quite low compared to a sloop of comparable sail area, making the rig safer and lowering the stay loads due to the shorter mast. The mast can be raised and lowered without a crane and transported on the deck for storage. The mast can be a spreaderless fixed section spar or a rotating spreaderless wingmast for added performance. 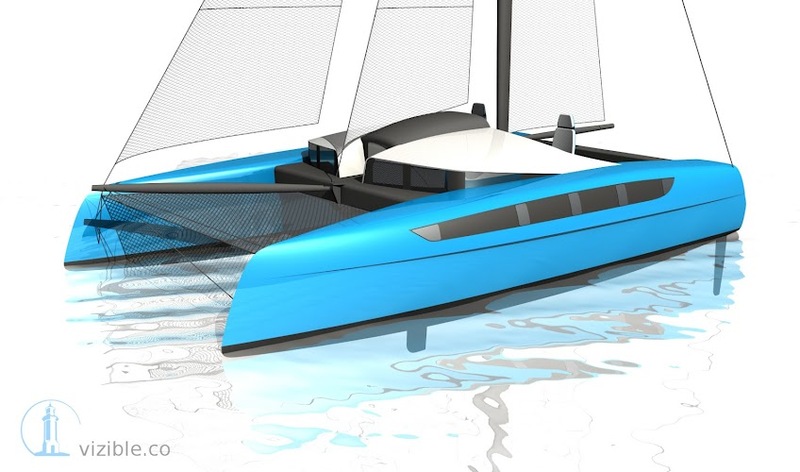 In the open bridge configuration, the catamaran can be dis-assembled and either shipped in a container or transported by road on a bespoke trailer. The hulls, central pod, solid decks, main box beam, mast and spars are all the pieces of the puzzle. The bridge helm stations provides a safe, comfortable and dry operational theater, all trimming and halyards within reach. 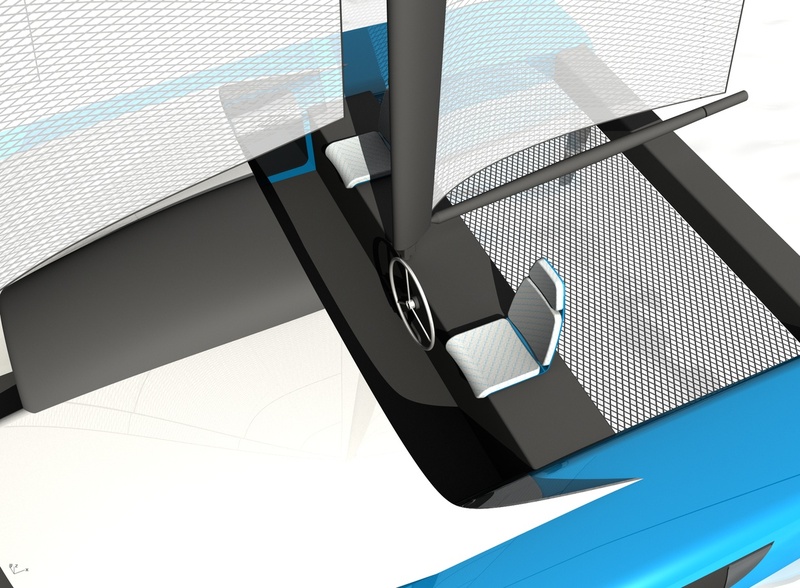 The helm stations are conveniently placed on the bridge walkway, with easy access to the saloon or hulls. The sheets and halyards are as short as possible due to the centralized handling of the running rigging. The single helmwheel column can be canted from port to starboard serving both helming positions. The hulls provide standing headroom in the entry, galley, head and nav station area. A generous bunk 100cm wide dwells aft being the main accommodation inside the hull. A single forward tapered bunk on STB provides another comfortable sleeping cabin. Folding table and seats transform the galley into a cozy dinning area for two. With the hard top version, you get two additional 150x200cm beds and a six person dining area. These stages can be offset apart years, while the owner can still enjoy sailing the boat in the open deck version. Offsetting time and cost apart while being able to enjoy the boat much sooner adds a lot of flexibility to the building process. Safety at sea, while speeding or exploring shallow waters - high AR kick-up rudders and a single kick-up center foil, with high AR for leeway prevention. 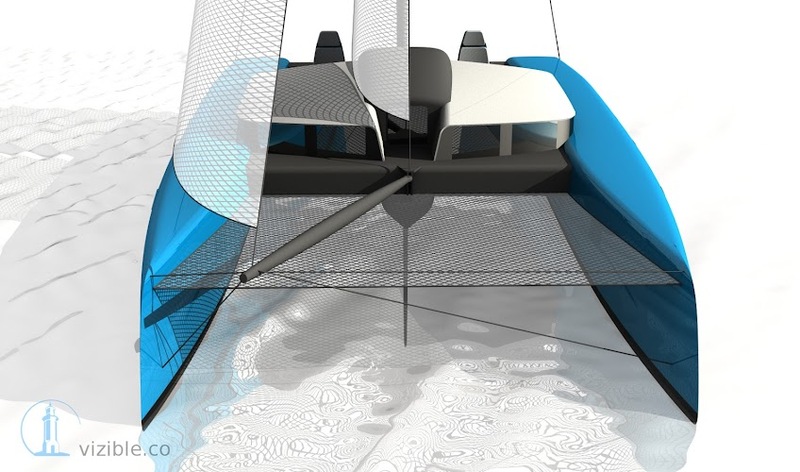 The single centerboard has a built-in advantage which is missing from 90% of the daggerboard catamarans on the water, it allows precise balancing of the helm by shifting its center of pressure fore and aft (rotating the foil around a pivot). 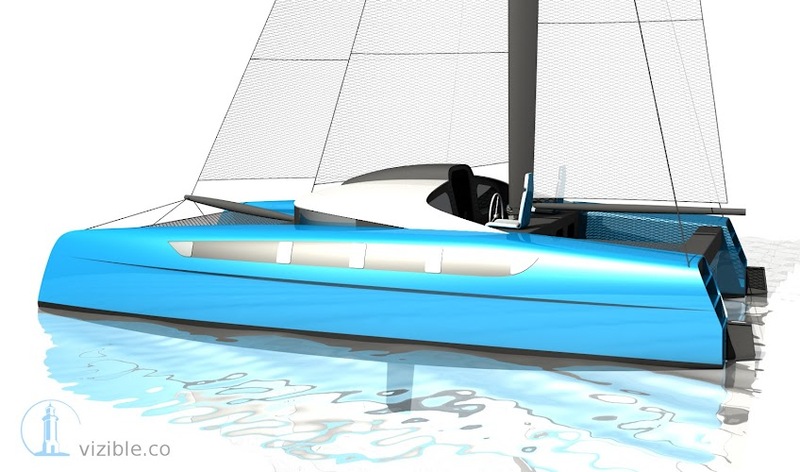 Constructional and functional simplicity are the main design drives behind VIZIBLE105. All shapes serve a purpose. The freeboard shoulder acts as a longitudinal stringer adding rigidity, it deflects spray, serves as a rub rail (commercial rub rail profiles can be fitted on for better longevity of the finish), it also provides a hidden ventilation intake and outlet (a labyrinth prevents water getting inside) and blocks fenders from riding up when moored. The only shapes needing moulding are the hull outer shells and the underside of the central pod, everything else can be built on a flat table, infused or vacuum bagged. The large beams provide structural strength and handy storage space. For construction simplicity, the hull windows are externally mounted, avoiding complicated construction details and reducing construction time. Deck hatches were avoided for the same reasons as above, although owners can opt to have deck hatches for more light. 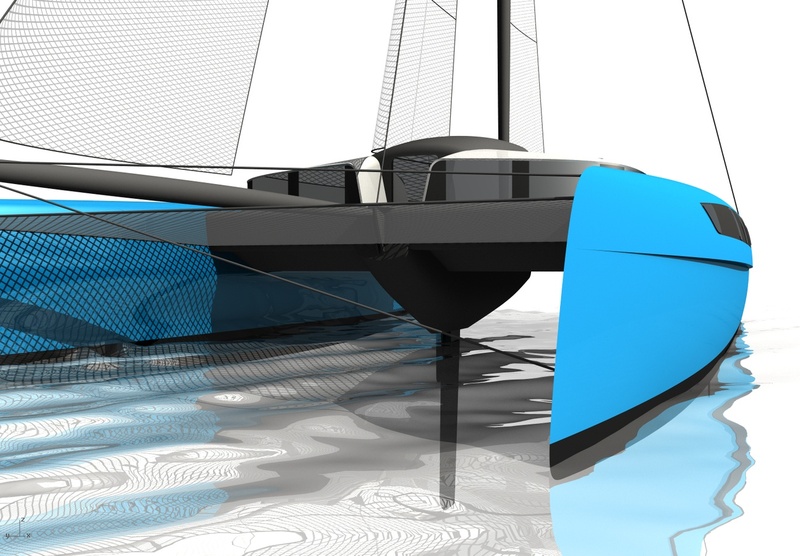 The hulls shells are monocoque, no complicated moulding, smooth throughout for easier finishing. Study plans will be made available in the shop, please get in touch if interested.